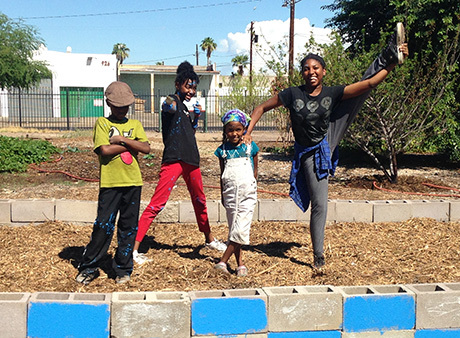 Almost one year ago, Asiyah, homeschooling mother of four, took her children on a field trip to visit St. Vincent de Paul’s Urban Farm located next to the downtown Phoenix dining room. What she didn’t anticipate was how this small plot of land that grows food to feed those in need, would greatly impact the lives of her children. After speaking with the farm’s manager, Chanika Forte, Asiyah asked if she could bring her children, ranging in ages 9 to 14, to the farm as a part of their science program for school. Chanika instantly loved the idea. However, an educational farming program did not exist at the time. So, she began to research and reach out to local partners to find out how she could make this a reality. She didn’t have to look far. 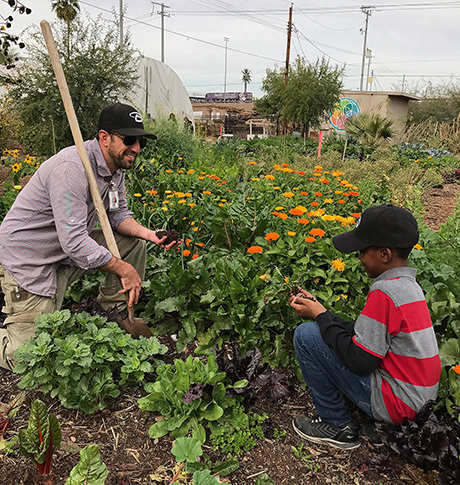 Staff members at University of Arizona’s Cooperative Extension, where individuals can obtain a Master Gardener certification, were so excited about Chanika’s plans, they donated the Junior Master Gardner curriculum and books to SVdP. Chanika started the official program in July and registered Asiyah’s children online to receive credit from the Department of Education. The classes were held every other Friday from 9 am to 12:30 pm. 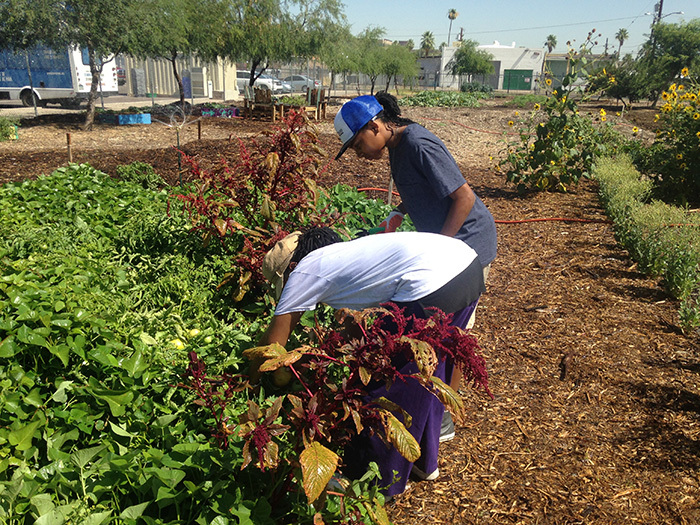 Selah, Serenity, Sahar and Saitara spent the first hour and half outside learning how to plant, harvest, and compost. The second half was spent in the classroom, learning more about the outdoor activity they had just completed. After going to several classes in the farm, Serenity and her siblings started a new garden at home, where they are currently growing pumpkins, tomatoes, garlic and carrots. “Me and my sister, Selah, love to bake. But now, instead of buying premade ingredients with preservatives, we grow our own pumpkins to make pumpkin pie,” she says. Selah, 11, said she loved learning about the eating healthy. “Once you think about it and know what’s not good for you, you just want to change the way you eat. Everything looks different now when we go to the grocery store,” she says. At the end of it all, Asiyah’s children provided over 350 volunteer hours in the farm, harvested over 400 pounds of food and completed 40 hours of classroom time. 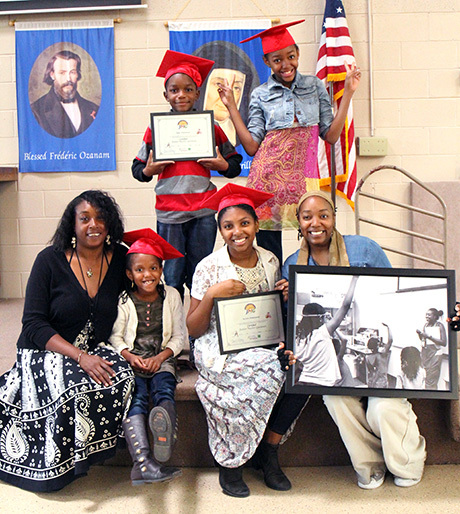 A graduation ceremony was held at St. Vincent de Paul to celebrate their Junior Master Gardener status. While the children are still volunteering at the farm, Chanika is currently working on a second curriculum level for them and planning another level one program for new students.